I suppose we need to talk about Miami's Giancarlo Stanton again. On Sunday, he became the first National League player since 2007 (Milwaukee's Prince Fielder) to hit 50 homers in a season, and the "unofficial" record of 62 is certainly in play. Stanton has 17 home runs in August, becoming the first player with that many in a month since Sammy Sosa hit 17 in August 2011. Barry Bonds also hit 17 in May of that year. The record for August homers is 18 by Rudy York in 1937. It's the ninth time in major-league history that a player has hit 50 home runs before the end of August. Outside of the span between 1998-2001 (i.e. the heart of the steroid era) when the 60-homer mark was reached six total times by the trio of Bonds, Sosa and Mark McGwire, the number has only been reached twice: in 1927 by Babe Ruth (60) and in 1961 by Roger Maris (61). Rather quietly, the Marlins have climbed three games over .500 entering this week and they are solidly in the wild-card race - although it's not likely they have the pitching to get a playoff spot. Remember when a team's best hitter used to hit cleanup? That's old-school nonsense nowadays. It's all about getting a guy as many at-bats as possible, and Stanton has been hitting in the No. 2 hole since mid-May. MLB Network game and a possible playoff preview. I'm stunned that Yankees catcher Gary Sanchez only got a four-game suspension for his role in last Thursday's brawl with the Tigers; Sanchez remains active while appealing. The Yanks start lefty Jaime Garcia (5-8, 4.52). He hasn't been great in four starts since arriving from the Twins, failing to last more than 5.2 innings in any of them. His first start as a Yankee was in Cleveland on Aug. 4 (4.2 IP, 6 R). Jay Bruce has faced him by far more than any other Indian, going 12-for-54 with a homer and 14 strikeouts. The Indians' Trevor Bauer (13-8, 4.59) was opposite Garcia in that game and got the win, allowing one run over seven innings. He has not personally lost since July 16. Todd Frazier is 6-for-19 off him with a homer and seven strikeouts. Key trends: The Indians are 6-1 in Bauer's past seven starts. The "over/under" has gone under in four of Bauer's past five in Game 2 of a series. The over is 3-1-2 in his past six vs. New York. New York has placed outfielder Yoenis Cespedes on the disabled list with a right hamstring injury, and his season could be over. There's really no point in the Mets letting him play again. Cespedes got his huge contract this offseason and, perhaps not coincidentally, has been limited to 81 games in 2017 due to injury. He spent six weeks on the disabled list earlier this season with a strained left hamstring. The Mets go with rookie Chris Flexen (3-2, 5.79). He has made six career starts, and the last was his longest, going six innings and surrendering two runs against Arizona. It's his first look at Cincinnati. Reds rookie Sal Romano (3-5, 4.96) got off to a shaky start to his MLB career but has thrown back-to-back quality outings vs. the Cubs and Braves. He has never faced the Mets. Key trends: The Mets are 2-9 in their past 11 Tuesday games. The Reds are 6-2 in their past eight series openers. The over is 5-2-1 in the past eight meetings in Cincinnati. Early lean: Reds and over. It has been nothing short of a disastrous season for the Phillies, but there might be hope in the form of rookie slugger Rhys Hoskins. Sunday was his 18th career game and he hit homer No. 11. No one has ever gotten to that number faster. Entering Monday, he had also homered in five straight games. The record is eight straight games, held by Ken Griffey Jr. (1993), Don Mattingly (1987) and Dale Long (1956). Philadelphia starts rookie Mark Leiter Jr. (3-2, 3.86). He comes off easily the best start of his career, allowing one hit over seven innings in a victory over the Marlins. He hasn't faced the Braves. Atlanta knuckleballer R.A. Dickey (8-8, 4.06) has pitched solidly enough that the Braves are considering picking up his $8 million option for next season, although Dickey hasn't decided whether or not to retire yet. He's 1-0 with a 0.64 ERA in two starts vs. the Phillies in 2017. Odubel Herrera is 5-for-11 against him with a homer. Key trends: The Braves are 5-2 in Dickey's past seven vs. teams with a losing record. The Phils are 2-9 in their past 11 vs. teams with a losing record. The over is 5-2-1 in Dickey's previous eight on the road. Early lean: Braves and under. Last week I wrote that Colorado manager Bud Black wasn't considering pulling struggling closer Greg Holland from that role. Well, things change. Holland was rocked again Saturday, and Manager Bud Black now acknowledges the club will "navigate" the closer role for the time being. Jake McGee saved Sunday's game. Meanwhile, Detroit has placed DH Victor Martinez on the DL because of an irregular heartbeat. It's possible that his season could be over. Detroit will rotate players at designated hitter while Martinez is out, Manager Brad Ausmus said - although the team loses the DH for this interleague series. Detroit's Miguel Cabrera received a seven-game suspension for his role in that Yankees brawl, but he's also appealing and thus can keep playing until it's heard. The Tigers start Michael Fulmer (10-11, 3.69), who played his own role in that brawl. He took a no-decision vs. the Yankees, allowing five runs in six innings. Fulmer has never faced Colorado. Rockies rookie German Marquez (10-5, 4.18) comes off a no-decision in Kansas City (6 IP, 2 ER) and faces the Tigers for the first time. Key trends: The Tigers are 1-6 in Fulmer's past seven on the road. The Rockies are 8-0 in Marquez's past eight at home. The under is 7-0 in Marquez's previous seven. Early lean: Rockies and under. Will this game/series even be played at Minute Maid Park? I'm not sure how it could be (it's surely going to be played but moved; one rumor has it going to the Rays' Tropicana Field). There has been unprecedented flooding in Houston due to Hurricane/Tropical Storm Harvey. Some parts of Texas could get an incredible 50 inches or rain. If they do play, Texas is expected to activate OF/1B/3B Joey Gallo from the disabled list. He hasn't played since Aug. 20 due to a concussion. Do you realize that Gallo has more homers (35) than singles (20) this season? That's incredible. Texas is scheduled to start lefty Martin Perez (9-10, 5.00). He has won four consecutive starts but was blown up in his lone outing vs. Houston on June 4 (3.2 IP, 6 R). He is 5-4 with a 3.05 ERA in 10 career starts against the Astros. Jose Altuve is 10-for-30 off him. The Astros' Mike Fiers (8-8, 4.17) dominated Washington in his last outing (7 IP, 1 ER). He's 0-1 with a 9.90 ERA in two starts this year vs. Texas. Elvis Andrus is 4-for-14 off him with two homers. Key trends: The Rangers are 2-6 in Perez's past eight series openers. The Astros are 9-3 in Fiers' past 12 vs. the AL West. The under is 5-0 in Perez's past five vs. Houston. 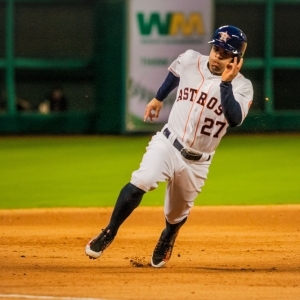 Early lean: Houston will be favored even if moved as the Astros would still be the home team. Perez looks like good underdog value with his history against Houston.